Christmas is over pretty officially now. Lights are coming down in all but the most oblivious households. All the cookies and baking have been begrudgingly eaten or gone stale. January diet season has started. It can all feel a little anticlimactic. It did for me anyways. I did not see my parents at all, in fact I spent the holidays with me new-ish boyfriends family, which was lovely. They did a great Christmas meal. But there is something a little formal about being around the new family. Everyone is on better behavior, you can’t force upon them your own, and perhaps eccentric, traditions. My mothers family is from Newfoundland, a provence with a long tradition of eccentricity and also of making the most of often scant resources. So the traditional Christmas treats I grew up with I now can’t help but consider and think, what the good goddamn? For example, my Nanny would make little treats called ‘Penguins’. They are little white cone shaped sweets dipped in a little bit of chocolate, thus, look a little bit like a penguin. But get this; the ingredients are coconut, icing sugar, and MASHED POTATO because why the hell not I suppose. And let me tell you, they are divine. ‘Trifle’ growing up was eaten, as you will see from the recipe below, not at all in the commonly held English idea of Trifle at. That is to say; cake, sherry, jam, custard, whipped cream, decoration. That is English Trifle. This is my great-aunts trifle recipe, and could be considered a little weird perhaps. For one, there is no cake, because there would not have been cake just lying around having the opportunity to go stale. It in fact has white bread in it. This sounds completely mad but works SO MUCH BETTER THAN CAKE. It keeps the sweetness down and keeps its shape in a nice way. This is also something you can make entirely out of boxes and cans of things. In face if you wanted to go purely authentic with my aunties trifle, it would have tinned carnation condensed milk in it, because that’s what they used. Regardless of how weird this recipe in its entirety might seem, please understand that this is the taste of total normalcy to me. It is a great example of how in life, you don’t know what you don’t know. In all the holiday wind down, when the weather stared getting really cold here, when I missed my family, this was what I had to make to make the post holiday sadness abate for just a little while. 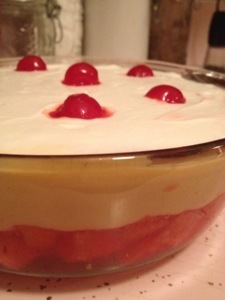 Because like this trifle, you don’t know you’re weird until you’re compared to someone else’s normal. And this is deliciously weird. Put the kettle on. Straight from the freezer, cut the crusts off the bread and cut into cubes. Put in the bottom of a glass bowl or trifle dish. Make up the jello with one cup boiling water and cool down with 4 ice cubes. Empty the can of fruit cocktail, juice and all, into the jello and pour over the bread. Chill for an hour or so. Make up the vanilla pudding using the 2 cups milk and pour over the jello layer. Whip the cream with the icing sugar and blob over the pudding layer. Decorate with a few halved maraschino cherries. Eat by the loving bowlful. This entry was posted in cooking at home and tagged Newfoundlander food. Bookmark the permalink.